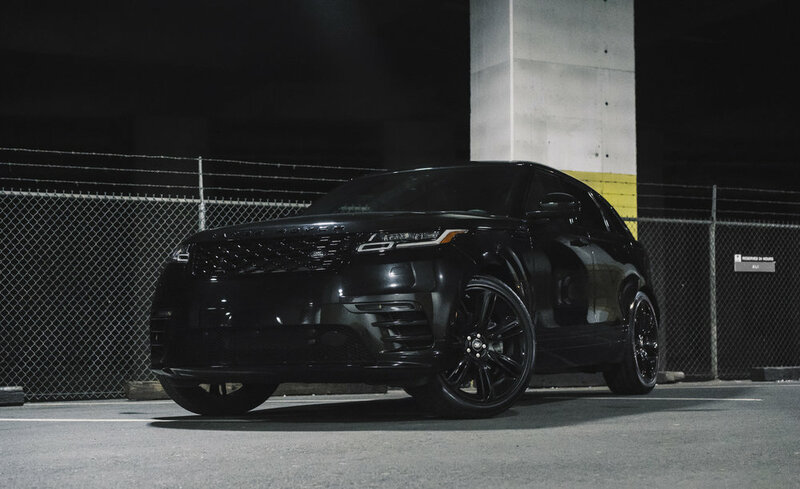 One look at the Range Rover Velar's blacked out styling, I fell in love with it. We take it out for a spin this week to check out how it is as a daily driven vehicle. Disclosure: Jaguar Landrover Canada & JS Auto provided me with the 2018 Range Rover Velar for a week to test drive, and photograph. All photos in this blog post was taken by me. It isn't as engaging to drive like the F-Pace. The blacked out Velar is the most attractive SUV on the market this year. Beautiful infotainment system that has a huge wow factor that make it feels very luxurious. Exterior wow factor translates to the interior too! I like how the dials on the infotainment system and steering wheel change to different options. Very modern look! One strange querk is that there is a 360 camera but when I'm in reverse mode it only shows the rear camera! It would be nice to see both the rear and 360 camera but maybe it was a setting I couldn't figure out how to activate it. Steering wheel feels really nice but there is one strange thing for me. The front of the steering wheel has a metal strip, so when you use the heated steering mode, it only heats the rear so the metal part doesn't get too hot. It feels a bit strange to me so this might be a con if you live somewhere that's very cold. Front of the steering wheel would always feel cold in the winter I think. Good amount of leg room. Very comfortable seats all around. Front passengers gets a massage seat! If passengers have trouble getting out of the car because it's too high off the ground the driver can actually lower it thanks to its air suspension system! Great cargo capacity like the Jaguar F-Pace! If the car is too high for you to load your cargo you can actually lower it thanks to it's air suspension! The Range Rover Velar is a luxurious high tech SUV that is very fashionable and has a huge WOW factor on the inside and outside. I'm not sure who wouldn't want a car like this if they could afford it. It is so comfortable to sit in for both the driver and passengers. It is the perfect size to drive around the city as a family vehicle. I don't have much negatives other than the options adds up quick and carries a hefty price tag for a cool car. There is about 30K worth of options you can add on. If you have the money to afford it that's great! If I had luxury car money this is exactly how I would spec it!